Some people are naturally gifted in the kitchen and can throw together a virtual feast with very little effort. However, if your idea of cooking involves opening a box and placing in the microwave for two minutes, then look no further. The following ideas are great to use on dates. An indoor picnic will melt the heart of even the least romantic person. If you live in reliably sunny climates then certainly go the whole hog and have an outdoor picnic. Picnic are fantastic because they require no cooking, very little cleaning up and are very easy to prepare. Try some French bread, a selection of cheese, a bowl of walnuts, some fresh ham , some hard boiled quail eggs and a fruit flan (hop bought but it will look fantastic). Take everything out of its wrapper and use boxes or greaseproof paper instead. If you really are going for it in the romance stakes, a bottle of icy Champagne and two glasses will complete the perfect picnic! 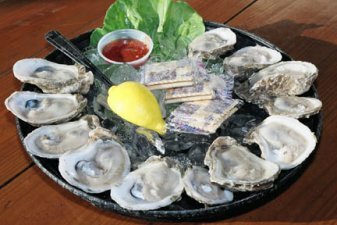 Oysters have been noted for years to have aphrodisiac qualities which is because of the high Zinc content. They are not loved by all and they certainly do not possess good looks, but if you know that your date enjoys seafood why not give it a try? A platter of crushed ice should provide the bed for the oysters. Serve with slices of lemon and a bottle of Tabasco sauce. The ensuing drama of the plate should be impressive enough to your date. Good luck and be prepared to join in the fun! There is nothing like a bowl of sweet ripe strawberries to entice a partner. Perhaps you are having a low key date watching a film on your sofa. Forget the popcorn, produce a glorious bowl of the best quality strawberries that your budget allows and if you really feel decadent, then produce a bowl of melted Belgium chocolate for dipping. By placing the chocolate in a bowl suspended over simmering water, the chocolate turns into fantastic sweet dip. Add a whoosh of cream for the ultimate night in. Attempting to cook a complicated meal for a date that does not know that you would have trouble identifying a potato masher , would be very stressful. Surely, the idea is to feel comfortable, know your limits and have an enjoyable evening. This can be achieved by turning to the old British classic “fish and chips”! If you are honest to your companion about your culinary shortfalls and manage to pop out to the local fish and chip shop before they arrive, a beautiful evening with newspaper wrapped delicacies could be yours.